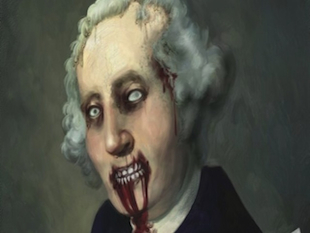 George Washington wasn't only America's first president, he was also almost its first zombie. After Washington died from an illness in December 1799, his family nearly accepted an offer from a physician who believed he could bring America's first commander in chief back to life. The website io9 writes that physician William Thornton is best remembered as the first designer of the U.S. Capitol. But he also proposed reviving George Washington's deceased body using a combination of blankets, an air pump and lamb's blood. Washington had become ill after traveling through the wet winter rain that year. He finally succumbed to his illness after a painful series of "treatments" that included regular blood drainings, having his stomach drained and drinking mixtures of vinegar, molasses and butter. Washington famously told his doctors before passing, "I die hard, but I am not afraid to go." However, he was reportedly afraid of being buried alive and asked friends and family to wait three days before holding his funeral. The strange tale comes from Holly Tucker's book Blood Work: A Tale of Medicine and Murder in the Scientific Revolution, which was released last March. The morning after his death, Washington's step-granddaughter brought Dr. Thornton to the Mount Vernon. That's when Thornton made the offer to Martha Washington. The plan involved thawing Washington's body which had been placed on ice, rubbing it "vigorously" with blankets, performing a tracheotomy to pump Washington's lungs full of air and then finally an infusion of lamb's blood, which at the time was believed to contain special medicinal properties. Washington's friends and family reportedly turned down the offer not because they didn't think it could work but because they felt Washington would have wanted to rest in peace. As it turns out, Thornton had other plans for Washington's body as well. Thornton secretly included a burial vault in his designs for the Capitol and hoped it would be Washington's final resting place. Martha Washington reportedly agreed to the arrangement, only stipulating that she be entombed next to Washington after her own death.